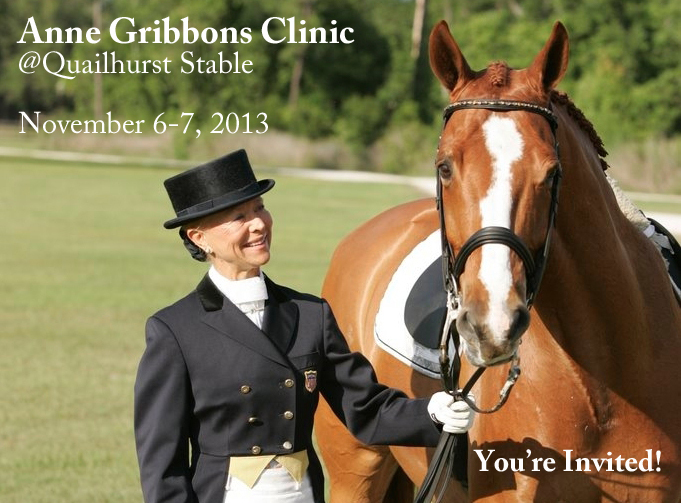 Once again we proudly announce Anne Gribbons will be returning for another dressage clinic, Wednesday and Thursday November 6 & 7th. With winter in the air we will be relocating to the indoor arena. We will again provide seating, all day snacks, and lunch to paid auditors. Lunch will be served in the main stable between 12:00-12:45. Please make your reservation to ensure we have a seat and a meal waiting for you! Audit fees are $25.00 per day or $45.00 for both days. Wine tasting will also be available during the hours of 11:00-4:00 in the tasting room for an additional fee of $10.00. The tasting room is adjacent to our indoor arena with viewing for the clinic. Seating is limited and reserved for tasting customers only. Wine by the glass can also be purchased at lunch in the main stable. Once again we have a wide variety of horses, levels, and riders which provides a broader education. Due to the size of the ring (24 X 44), seating is intimate and the training very focused. Anne is responsive to questions throughout the rides and will be taking any questions at the conclusion of the day.